Oswald the Lucky Rabbit needs Mickey Mouse’s help; something terrible has happened in Wasteland, and its up to the first true team-up between these two characters to put things right. A horrible earthquake has split Mean Street right down the middle; all the areas of Wasteland have been affected by this terrible tragedy as well. But what caused this earthquake? Was it natural causes? Probably not, as Wasteland does not have a history of seismic activity, being a giant cartoon on a wizard’s table. Perhaps it’s a mad scheme from the Mad Doctor; he’s been very helpful with the clean-up, and Oswald seems to think he’s in the clear, but his cat girlfriend Ortensia is quick to point out his name is the Mad Doctor, after all. Also, one of the Gremlins, Prescott, has been acting a bit … off. Surely a gremlin couldn’t be behind the accident? For the sequel, the cast has been upgraded with full voice acting, and not just the main cast; all the extras wandering around are fully voiced, and each with a distinct voice actor and lines. No same two voices endlessly regaling you with the news that they saw a mudcrab the other day. Horrible creatures. The biggest voice actor belongs to Mickey’s loyal sidekick, Gus the Gremlin. He is voiced by none other than Cary Elwes. Younger readers probably know him best as the guy who took a hacksaw to his own ankle at the end of the first Saw movie, but older readers will remember him best as the Dread Pirate Roberts. Now he gets to annoy you with constant not very helpful hints! The gameplay is little changed for Mickey Mouse from the first game; you shoot Paint or Thinner from a magic brush; Paint creates things and befriends enemies, Thinner destroys them. This time around, things stay painted in or thinned out if you leave the area and return later. The game is now playable with a second controller; I did not have the opportunity to test this mode out, but I wonder how playable this is thanks to an issue that plagued the first Epic Mickey. 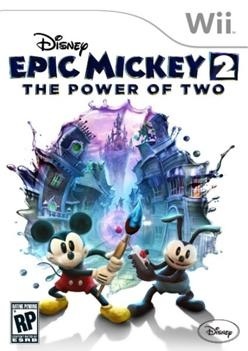 If you liked the first Epic Mickey, you’ll like this game. It’s that simple. Much like the first game, you have fun, likable characters in a decent story with some pretty nice 3D platforming with Zelda-esque puzzle solving, with the same single glaring flaw. The game ends with a sequel hook; I’m looking forward to it. Just fix the darn camera, please! This review is based on the Wii version of the game. It is also available on the Microsoft Xbox 360, Sony Playstation 3 and Nintendo Wii-U. Released in late 2010, the first Epic Mickey sold 1.3 million units in its first month, despite mediocre reviews that called it out for poor camera control. The second game fared much worse last holiday season, moving just over a quarter of a million units in its first month, which likely contributed to the studio's closure. Ssiu points out this interesting article about retrieving Oswald from the archives and giving him a voice – and a personality. Yeah, I avoid other reviews and news about stuff I intend to review; I realized after I wrote and submitted the bit about the sequel would get really silly really fast.